Nils Frommhold leads Luke Bell. Nils Frommhold and Luke Bell are through 105kms and our spotter Toby Coote says the wind is getting up and will be in the face of our riders heading back out to the turn. It is not super strong but will play a part. Word is the second men's chase pack is moving strongly up to the first chase pack to form one big pack. Toby Coote believes this will play into the hands of our leaders. Mel Hauschildt is through third at 3:17 down, Yvonne van Vlerken at 6:09, Bree Wee at 8:16 and Mirinda Carfrae continues to lose ground at 10mins behind at 90kms. Through 110kms our men's leaders are now 5:30 clear - with now one big chase back of 12 riders together as our leaders continue to stretch it out. Our spotter Toby Coote has spoken to Luke Bell who indicated he is not feeling great and right now hanging on to leader Nils Frommhold at the 120km mark. Their lead is 5:30 on the big chase group of 12 riders. Women through 105km - Steffen and Luxford lead by 2:50 from Hauschildt and Van Vlerken at 5:50. At 120kms the men's leaders Bell and Frommhold are now 6.30 ahead of the big chase pack and moving away. Nils Frommhold has not raced here before but has a strong background in the sport with IRONMAN wins in Arizona in 2012 and South Africa last year - with fifth at the IRONMAN 70.3 Worlds and sixth at Hawaii. 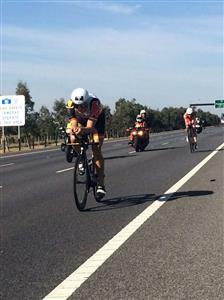 The men are nearing the turn for the final time on t he bike at 135km. Caroline Steffen and Annabel Luxford are through the 120km mark on the bike. Nils Frommhold and Luke Bell are around the turn at 135km and head back to Frankston. Has their lead stretched to breaking point? Mel Hauschildt is closing now 2:10 behind the leaders at the 120km mark. We are waiting on the big pack of 12 riders in the men's race to go around the turn at 135kms. The 12 chasers are around - and they are now 8:20 down. Looks like the big bunch are looking at each other - they have dropped four minutes in the 45kms to the turn - is this the losing of the race for anyone in this group? That chase back is Skipworth, Millward, Robertson, Symonds, Tim Berkel, Bittner, Kramer, Kahlefeldt, Raphael, Munro, Van Berkel and Albert. Caroline Steffen and Annabel Luxford are around the turn at 135km for the final time. But the big news is that Mel Hauschildt has closed to just 1:40 behind in third. The race is on. By the way we have just lost power here at St Kilda so our live cover has stopped but we will keep going ... while it is fixed. Asa Lundstrom has pushed into fifth placed at 1.6km on the run. Through 5km on the run and Caroline Steffen has a 20 second lead over Annabel Luxford, with Mel Hauschildt pushing to 3 mins behind. At 7.5km our spotter Toby Coote says that Tim BErkel looks the best of the chasers in the men's race with Brad Kahlefeldt is looking strong. In the women spotter Amanda Balding believe Caroline Steffen is looking very strong and now has a 150m lead over Luxford. At 10km on the run Frommhold leads with Bell at 5m, Tim Berkel at 10m, Albert at 10:31, Kahlefeldt at 11:14, Van Berkel at 11.15, Millward at 11.31 and Symonds at 11:41. Hauschildt is the big move in the women's race moving faster than anyone over the last 2kms while Emma Pooley and Mirinda Carfrae are also on pace in the run. At 15kms Tim Berkel is less than a minute behind L:uke Bell in second with Nils Frommhold now with an 8:42 lead - even at this early stage the race is his to lose. The other big mover is Jeff Symonds from Canada who Jason Shortis says is possible the strongest runner over the back-end of this race. At 17kms Tim Berkel is into second place with Luke Bell now walking. Brad Kahlefeldt is almost into third with Symonds at fourth. Our spotter Amanda Balding says the heat is becoming a real factor and they are all looking for nutrition at every aid station. Caroline Steffen is looking strong in the lead through 7.5km with Annabel Luxford running well at 35s down, Mel Hauschildt third at 2.40 with van Vlerken 6.10. It is hot for sure - Jeff Symonds stops at the aid station to grab as many drinks as possible. he has less than 5km to run. Melissa Hauschildt has started to cramp at the 28km mark. She is walking and cannot get running again yet. There's still 14 kms to go so there's a lot of story left in the women's race. Caroline Steffen is 3:30 down on the leader who is still walking - Zena is digging deep to get back into stride. Melissa Hauschildt is jogging only right now and still cramping/ it does not look good. Annabel Luxford is at 5:40 down but our spotter Amanda Balding says she looks the strongest of the three. Hauschildt is running again and trying to run out the cramp. Drama in Melbourne. Jeff Symonds is through 40kms - now he can dare to dream. His first IRONMAN victory beckons. He looks behind him - Jeff there's no-one in sight. he runs along the board walk through the throngs of people on the beach. Meanwhile Hauschildt has stopped for medical intervention for some cream on her feet to help the cramp. She has lost a minute at least but running more freely. meanwhile the focus is on this remarkable finish line at St Kilda in Melbourne - and Jeff Symonds looks to the finish line. He has nearly three minutes lead on Tim Berkel.